This article is about the roll of electrical tape. For the full roll of white duct tape, see Superstick Textile. For the used roll of white duct tape, see Exhausted Superstick. The Furious Adhesive (ネンチャクシツ?, lit. : "Sticky Matter") is a treasure in Pikmin 2. 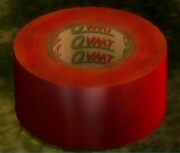 It is actually a roll of red electrical tape by a fictional company called Qvmt. The item is found on sublevel 7 of the Subterranean Complex. It is recommended to rid the vicinity of Gatling Groinks and bomb-rocks, as they may become an impediment during the Pikmin's journey back to the ship. Analysis of the Furious Adhesive. A roll of red duct tape from the real world. This page was last edited on December 12, 2018, at 18:16.